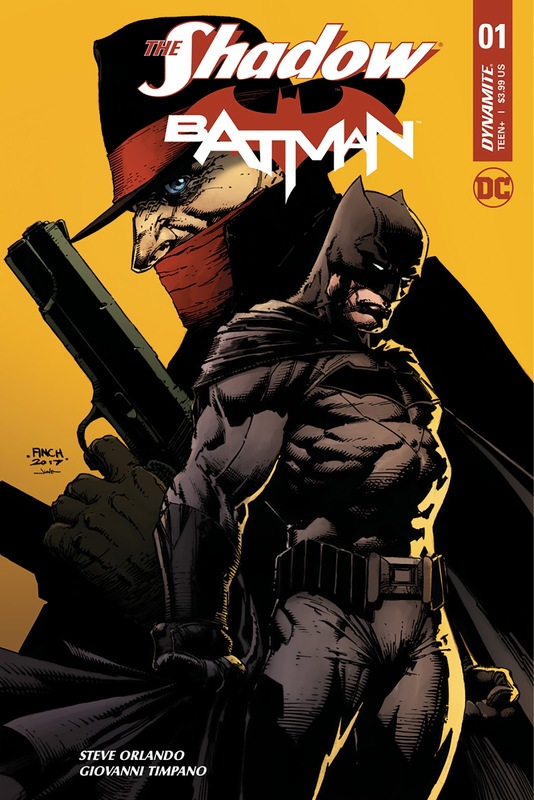 Steve Orlando is back with another crossover, The Shadow/Batman, after taking on the same characters with Scott Snyder at DC Comics. Now, it's Dynamite's turn and things haven't gotten any less complicated when Professor Pyg invades New Year's Eve and Damian Wayne confronts Bruce. Fresh from Batman/The Shadow, Orlando has conjured up another thrilling and mysterious adventure for these two iconic heroes. Professor Pyg and his Dollotrons terrorize the public on New Year's Day when Batman arrives to regulate the situation. A surprise appearance from Damian as Robin irks Batman and becomes a point of contention between the two. Meanwhile, The Shadow only makes a couple of appearances but makes a terrifying discovery when he taps into Pyg's psyche. This is really about Bruce and Damian. When Damian won't listen to reason about pulling back from his current mission things escalate into hand-to-hand combat. Every Batman story finds new conflicts and tensions among the Bat-family but this one is especially complicated because of their history. Pyg isn't the primary villain but only alludes to a bigger threat coming. The Shadow makes more a cameo in this first issue. Orlando delivers a gritty and exciting script that moves fast with little insight into the overall plot. It could seem a little convoluted but he's clearly holding on to more information to be revealed in coming issues. He sets up a complex story and Batman and The Shadow still haven't shared a panel yet. Giovanni Timpano has created some amazing visuals for Image Comics' 'Eclipse' series and does the same here. Timpano fills each panel with so much detail and his take on New York City and the Batcave is dark and foreboding. Flavio Dispenza's colors add to the tension and dark atmosphere. 'The Shadow/Batman' has all the makings of a great crossover but it may take a couple of issues to determine just how great. The Shadow barely shows up in this one so expect more in the next issue and hopefully, the true villain will be revealed. Overall, this is an exciting if not a little confusing first chapter but worth checking out to see where it goes.